Pelikan has recently relaunched their 101N series in Lizard, Red Tortoise, and Brown Tortoiseshell. They look very similar to their vintage counterparts and feel quite similar in terms of the size and design. Pen #15 below is a 1937 Pelikan 101N Lizard. It has a delightful double-broad, flexible, italic nib. This specimen (no pun intended) is in near mint condition. Although you can find the modern Lizard, it won’t have a nib like this on it! The 1933 Model 100 Pelikan next to it (#14) is considerably more rare. It is the Tortoise with a red cap, cap top, and turning knob – it’s a very different red from the modern Red Tortoiseshell being produced (below). This model is rare! The nib is a medium/fine extra-flexible nib with some slight band brassing. These two models, although available today in their modern form, are more special in their vintage form in part because of those incredible nibs. 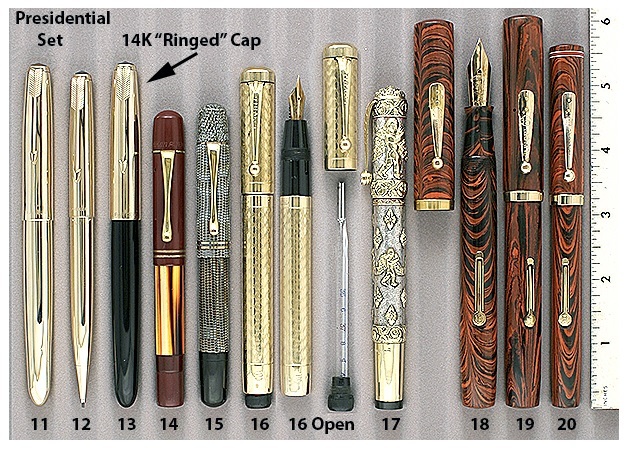 Both of these models were available in Catalog #71, but as extraordinary vintage pens… they are long gone! This entry was posted in Modern Pens, Vintage Pens and tagged Fountain Pens, Go Pens, GoPens, Pelikan, Vintage Fountain Pen, Vintage Fountain Pens, Vintage Pen, Vintage Pens. Bookmark the permalink. Follow any comments here with the RSS feed for this post. Post a comment or leave a trackback: Trackback URL.